The newly rebuilt FUNCHAL departed Goteborg on her inaugural cruise last monday, the 2.9.2013, the ship visited on this maiden voyage after resuming service ending a period of three years laid-up in Lisbon and the changing of owners from C.I.C. 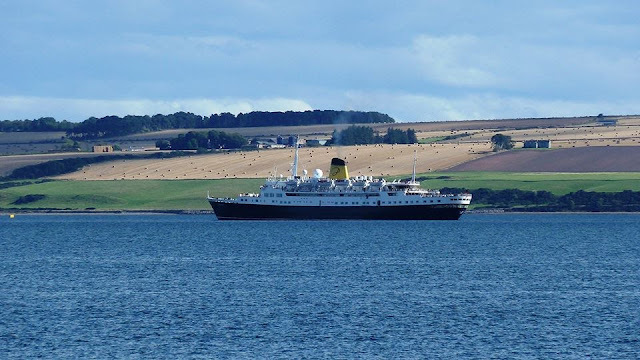 to the brand new PORTUSCALE CRUISES, first Portuguese Cruising Company, Kirkwall, Invergordon and Aberdeen before arriving back tomorrow at the Swedish Port of Goteborg. FUNCHAL had a scheduled call at Leith/Edinburgh yesterday but apparently due to bad weather this was cancelled. Photos above taken by Richard Clack, copyright photos, 5.9.2013. Thank you very much Richard for sending me these excellent photos.